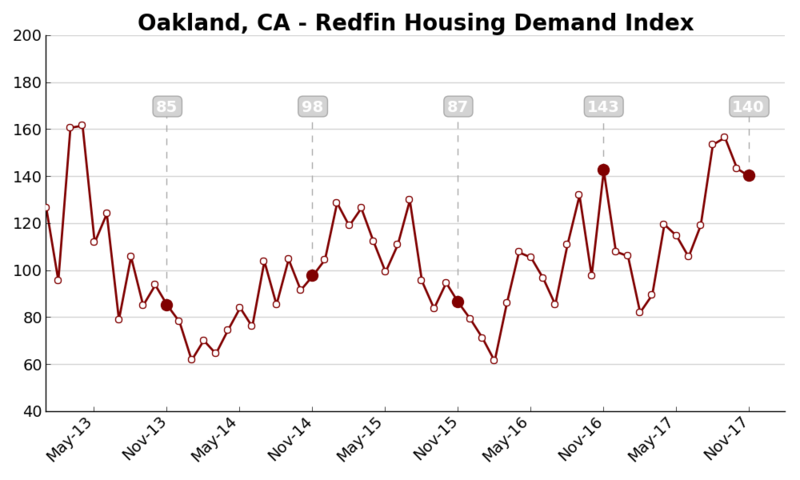 Redfin’s Housing Demand Index, which is based on Redfin customers requesting home tours and writing offers across 15 major metro areas, fell 6.2 percentage points from October (136) to November (127) — the third consecutive month of declines after a summer of “virtually flat” readings, the company reported today in a blog post. The seasonally adjusted number of buyers requesting home tours and the number of buyers making offers decreased by 1.9 percent and 14.7 percent, respectively. Redfin chief economist Nela Richardson says the index decline reflects the morale of buyers who are growing weary of limited options and high prices. Richardson’s assessment echoes the National Association of Realtors’ Q4 HOME Survey results, which showed a three percentage point decrease in consumer confidence from Q3’s record-high levels. NAR chief economist Lawrence Yun said the decrease was due to the lack of lower- and mid-priced options for first-time buyers. Although the index was down month-over-month, demand for housing is still surging — up 29.1 percent — compared to a year ago, with Redfin reporting a 41.3 percentage point increase in home tour requests and a 10.5 percentage point increase in written offers over last November. “Demand has consistently remained about 30 percent higher than last year’s levels since May,” the report noted. At the metro level, demand in Chicago (index reading: 104), San Diego (108), Boston (118), Portland (118), Los Angeles (129), Phoenix (139), Denver (159), Washington D.C. (159) and Seattle (170) has continued to grow year-over-year, while demand in Oakland (105), Orange County (105) and San Francisco (95) has dropped from November 2016. 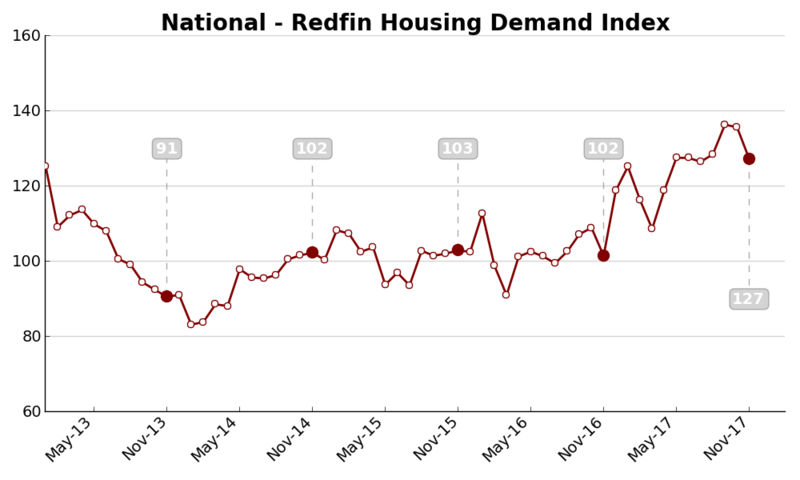 The Redfin Demand Index is adjusted for Redfin’s market share growth. A level of 100 represents the historical average for the three-year period from January 2013 to December 2015. The index is based on the following 15 metros: Atlanta, GA; Austin, TX; Baltimore, MD; Boston, MA; Chicago, IL; Denver, CO; Los Angeles, CA; Oakland, CA; Orange County, CA; Phoenix, AZ; Portland, OR; San Diego, CA; San Francisco, CA; Seattle, WA, Washington, D.C.